I have been building , restoring and racing old cars since the 1960s and have had friends who all tried to persuade me on the water in their boats. Some of these have been very impressive sailing boats. I also spent a few months as a ghillie on a highland loch where I put in a lifetime of rowing. Last year I decided to hang up my racing helmet and overalls after many exciting years on the circuits. We live near Cognac now as does our daughter and husband and grand-daughter, Daisy. I mention this, as their house has a lovely long garden which runs down to it's own little harbour on the River Charente. 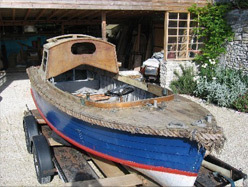 My friend Rob from Dublin told me one day in April 2007 that he had been offered an old wooden boat which was stored in a rusty old barn in Ireland, and it was cheap as well. The farmer who owned it had brought it back from Salisbury and after the ferry crossing, along the Faulds Road during the rioting , where it almost got torched by a mob ! He had then attempted to fit an outboard motor, as ,when the boat was sold by the Admiralty -(7.3.62) to a Mr S Stevens, it was missing engine, fuel tank and instruments. The farmer patched her up with some body filler here and there , but essentially the hull was in decent shape. 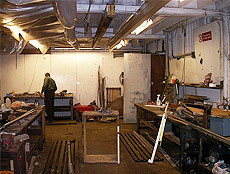 In storage, unfortunately it was propped up badly and part of the bottom double diagonal planking was stoved in. This , he plastered up with filler. Anyhow, when I got the photos, it looked to me to have a flat bottom which I presumed meant it had been built for shallow river work. What do I know ? ! - and would be fine for the River Charente. My sailing pal from the Holy Loch declared , on inspection, that this was " just the very boat for Erik ". Rob kindly offered to tow her all the way down to here, and so, I 'joined ' the Navy ( so to speak ). At first, I was intrigued by the 'funny' cabin and the markings, and didn't know what wood she is built from, but then I had a huge boost when the BMPT and Richard Hellyer produced a fabulous amount of information on her and boats like her. So, instead of restoring vintage cars I was facing the restoration of a classic naval vessel. SOME. . . .things are similar, but not all by any means and I have been on an almost vertical learning curve. I am happy to say that, although there are thousands of experts on every facet, I have had nothing but friendly and willing advice as I go along, which certainly boosts the morale. Here are the first pics I had and then when she first got here-. . full of Irish straw etc ! YES. . . . . .I went ahead. Are we all as crazy? Or would we call it romantic and a challenging project. 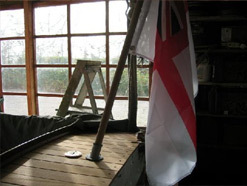 I was lucky to get the boat's life story to date from Mr Holtham,of the World Ship Society, British Armed Forces Small Craft Historical Research Group,and Philip Simonds, which is fascinating. FMD 5383 was never allocated to a ship but kept in Naval Reserve at Portsmouth. She had been built in 1953 in a batch of 8 by Bushnells of Wargrave near Reading. ( I tried, unsuccessfully to find out anything at all about her from the yard, but they couldn't/wouldn't help). Anyhow, I soon discovered all the forums which can help and also the writings of Don Danenberg the Chriscraft guru. I also discovered the joys of French exotic timber yards. Luckily, apart from the missing engine and instruments almost all the original fittings were still in place. The Irish farmer had , however, neatly sliced off the rudder blade and lost the propellor, though I did get the propshaft. The steering was like new, but gummed up, and the wheel was falling apart with rust ( replaced perfectly for 8 euros at a local flea market!). 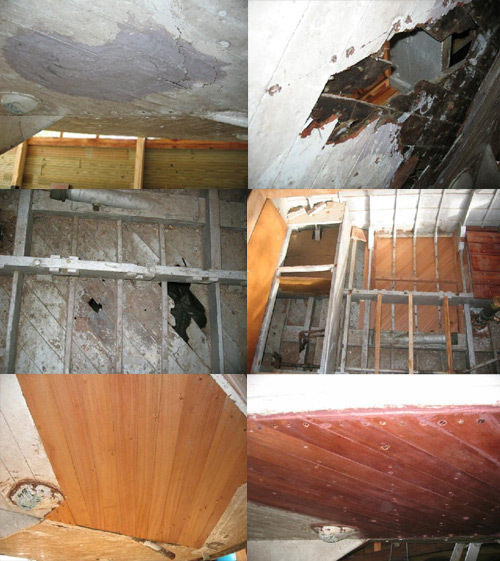 I decided to replace the rotten gunwale top boards first, and also recreate the partly missing floorboards. For these I have used Utile ( 'Sipo' in French ). . . and learned all about rivetting and scarph jointing. I treated all this timber with a water-based epoxy sealer called Resoltech which is highly spoken of here. Richard then told me that the BMPT 'Dainty' had been sand blasted and epoxy caoted. I got it in my head that this is a 'bad' thing to do to a wooden boat, but since then I have spent many a bemused hour trying to work out the best thing to do with my little beauty. Probably he is right, and life is just too short to completely restore such a craft unless it is of great historical merit. Mind you. . .of the 954 built I believe that only 8 survive. By now I had begun to try to consider how I would want to use the boat, and where. The exposed prop and rudder might be a problem in the shallower bits of the river, and the sea seemed to be a totally viable option if I could trail her there when we wanted. The sea near us is the lovely huge bay south of La Rochelle and takes in the Ile de Re and the Ile d'Oleron as well as Rochfort and the north of the Gironde estuary, and is about 45 minutes from here. I can launch from plenty places there. 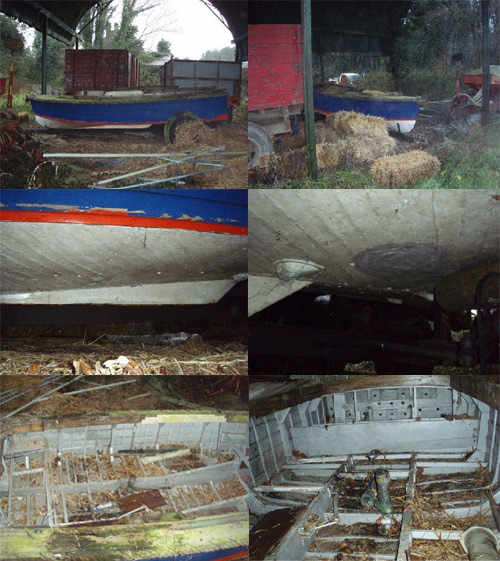 So. . the restoration must be strong enough on the 55 year old boat. Also, the engine choice occupied my attention for a while. The original was a Coventry Climax KF4 2stroke diesel with Roots blower giving 50hp at 2000rpm. Of course these are extremely rare, difficult to find parts for, heavy, and stinky diesel, so I cast around for more modern and lighter, non smelly alternatives. It is possible to find such a thing, but extremely expensive, maybe more than the value of the boat. So I decided to let the choice rest until we have a boat that floats, and get on with the repairs. I hacked off the large lump of car body filler to find cracked and broken planks. How to repair ? 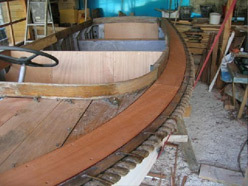 Don Danenberg in the US was suggesting that the only proper way is to replace the whole bottom double diagonal planking. I just could not consider that so I removed the broken bits and took the hole back to floor timbers leaving a rectangular hole. Then I replaced these with inner and outer diagonals of sapele. I did not use the fabric middle sheeting but a layer of 3M5200 to seal and glue it all together. Instead of rivets into the cross timbers I used silicon bronze set screws. . .and the same at the ends where they meet the chine and the keel. Of course , all this time I have been struggling to understand how Steve Smith's product CPES competes with West System, complicated by the French system -Resoltech. This was compounded by the french agents of 3M only supplying to the trade and not me, so the fabled 5200 became a serious quest reaching as far as California. ( still not really resolved). However, whatever happens it seems that I will be removing all the underside paint and treating the old wood with some sort of epoxy to firm it all up before the final surface whatever it might be. We visited the chandlers on the Hamble with little success, but did succeed in buying the correct shade of paint - Admiralty Light Gray- which has quite a light blue tinge to it, for the clinker sides. I had a stainless steel fuel tank made here in Angouleme . Next jobs. . . . .1:repair the transom where the Irish farmer had run a load of iron coach bolts through to mount the outboard, as well as a couple of splits incurred at the same time. 2: Clean off the paint on the inside. 3: Turn her over, strip the paint and treat with penetrating epoxy . . ETC ! Some biggish gaps to deal with. . . . epoxy to the rescue? Of course , after that I will have to finally do something about an engine, propellor and rudder. Instruments and so on. So , we won't be preparing to launch for a while yet.. . . .which gives me time to produce a suitable trailer ! Also a friend visited HMS Belfast for me, and took lots of photos of the FMD on board courtesy of Nick Hewitt. These are very useful, even though the boats are quite different in places. I know that mine has not been messed with ever, and the originality is still there. I feel I can name her for the first time, as she never was allocated to a warship. I ran through about a dozen great names, but think we are happy now with- 'Dragonfly', which carries a certain significance I feel. That's it so far, after one year. I hope this time next year we will be able to enjoy this rare little craft. You will notice a new button on the navigation panel. This is the temporary home of the Coastal Forces Veterans (London Group), and we welcome the Group membership onboard. We are privileged to have your company, and wish you every success in your endeavours. It is with deep regret that we have to advise of the passing over the side of one of our Founder members, Rear Admiral Sir Roy Halliday. KBE.DSC. last week. An obituary will be placed on the site shortly. MSMB 5302. You will see from the photos attached she is looking a lot different from when you last saw her, the engine housing has been lowered to make a more 'sensible' way to get to the aft deck, still got to install air intake vents to the top for those beasts to breathe ! 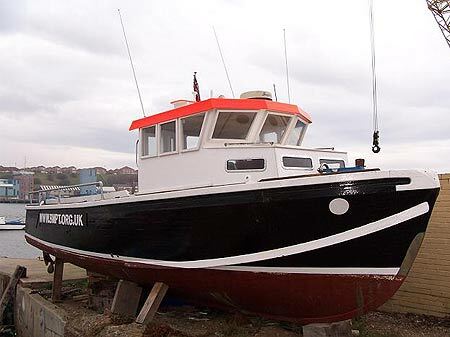 I haven't yet done much to the engines as the wheelhouse and painting was more important, now that the weather is cold and damp its time to work on the engines.... Click here to read more about it. 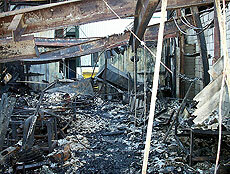 On the 30th November a fire started in one of the engine bays at the Hythe boatyard. The Medusa Trust are restoring Medusa on this site, and thank goodness Medusa herself is safe. No lives were lost or injuries sustained. The Medusa engines are being assesed for a second restoration, and the results of this, as well as further information, can be found on the Medusa site, which is available on our links page. We are sure everbody will join us in deep sadness, and sympathy for the Medusa Trust as this will cause problems for the progress of the restoration. The team are however, hard at it getting things back on track, and the dedication and positive actions are to be applauded. We wish the Medusa team all the very best of luck. The BMPT Ltd had taken a part of the other engine bay at Hythe, and we had collected a large amount of P6 engines. gearboxes and new parts. The idea was that we build a new engine and gearbox for Ark Royal, to replace the ailing existing plant. 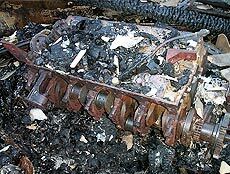 Unfortunately the entire project went up in flames, and what is left is not worth salvaging. The boat itself is quite safe. No insurance was in place, as getting insurance for 1960 used engines would have cost more than the value of the goods. The finance for this project was privately funded, and therefore the Trust itself is not affected finacially. We are agreed that the project must continue, and to this end we are seeking new premises, as well as new stock of Perkins P6 engines and gearboxes, and Perkins P6 parts,to continue the work.